George's Dentures Shine At Dentistry Museum The question of what George Washington's false teeth were made of may be the oldest bit of trivia in the United States. But at the National Museum of Dentistry, it's anything but a trivial matter -- the dentures are the star exhibit. 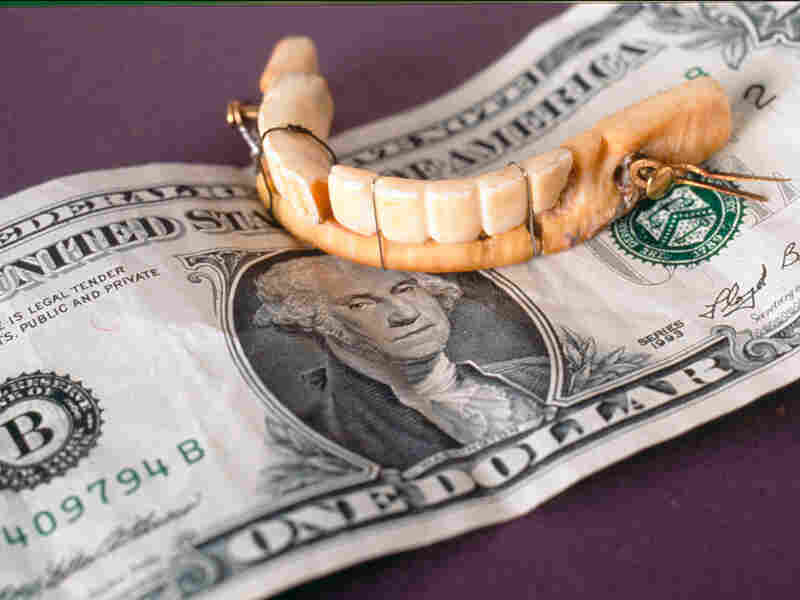 George Washington's lower dentures, perched atop a $1 bill. The question of what President George Washington's false teeth were made of may be the oldest bit of trivia in the United States. But at the National Museum of Dentistry, it's anything but a trivial matter -- the teeth are the star exhibit. The Baltimore museum proudly displays Washington's dentures, which are made not of wood, but of a more exotic and lasting material: hippopotamus ivory. An affiliate of the Smithsonian Institution, the museum brands itself as "the Smile Experience." 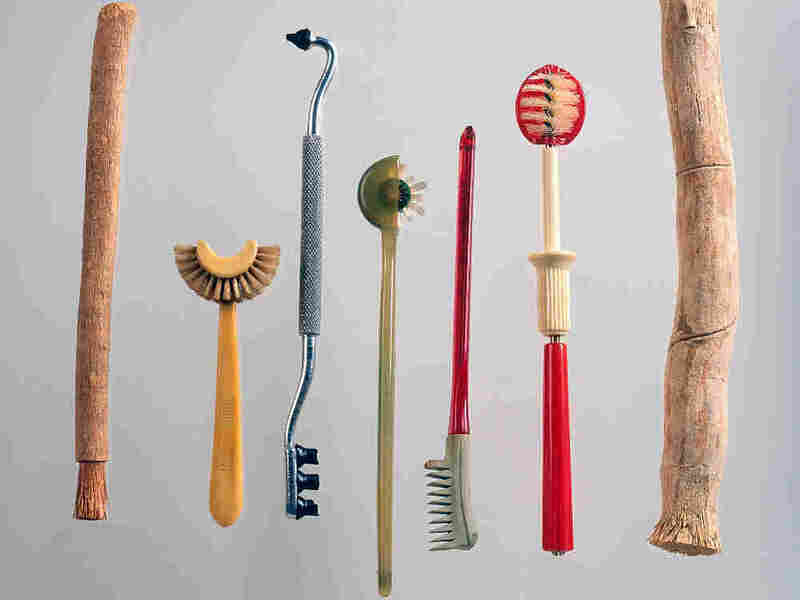 "We have a really light-hearted and humorous approach to the history of dentistry and all things tooth-related," says Amy Pelsinsky, the museum's director of communications. The exhibits include Queen Victoria's personal dental instruments; a display of toothbrushes throughout the ages; and a narwhal -- an Arctic whale with a six-foot tooth growing out of its head. Roughly 10,000 people visit the National Museum of Dentistry annually. Many of them are kids, who can don lab coats to "play dentist" and learn how to floss and brush properly on a giant mouth. Those old enough to remember the tunes can sing along to old toothpaste commercials. By far the biggest draw, though, is Washington's dentures, which were fashioned by his favorite dentist in Philadelphia. Washington needed them badly, Pelsinsky says. Despite writing in his diaries that he used toothbrushes, Washington had only one tooth in his mouth by the time he was inaugurated in 1789. "We think he had many illnesses throughout his life, you know, it was tough living back then," Pelsinsky says. "And the medicine was tough too, that people took. And the medicine actually made your teeth fall out." Siwak sticks, or "chew sticks," like those on the far left and far right have been used since Babylonian times, particularly among Muslim and African cultures. Taub's patent toothbrush had a convex, semicircular design made to conform to the tongue side of the teeth. This early 20th-century design was made out of celluloid. Next is a rubber-tipped combination gum-stimulator and toothbrush with an aluminum handle, pre-1945. The Strockway rotary toothbrush was designed with long and short bristle tufts to enable them to go over and in between the teeth as the toothbrush was rolled along the teeth. Circa 1950s. Dr. Mayland's toothbrush with rubber points instead of bristles, circa 1920s. The Rotor toothbrush was designed to clean the teeth vertically, circa 1930s.